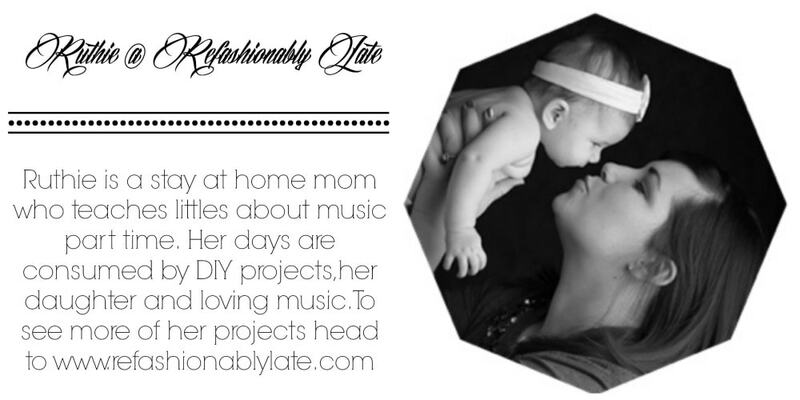 Welcome back my friend and contributor Ruthie from Refashionably Late! She is sharing how the power of paint made a big difference in her front door’s appearance! 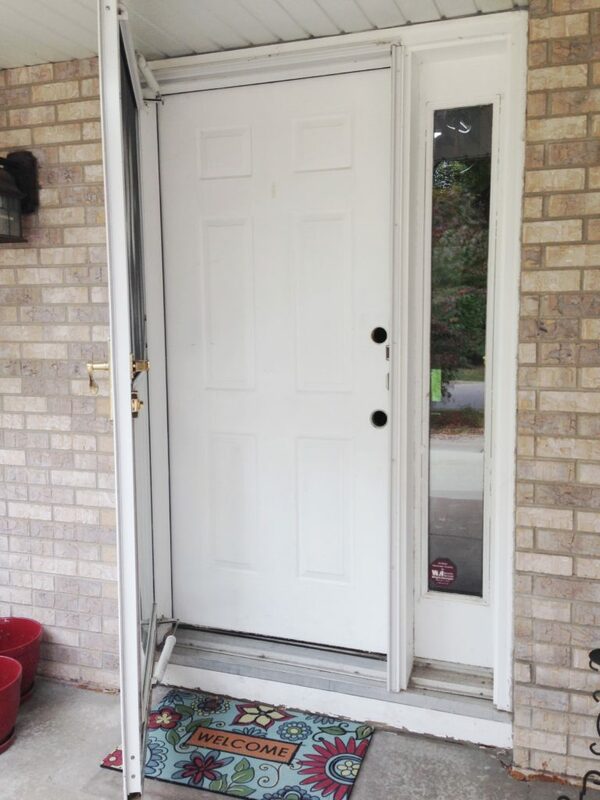 I hope you love her Easy Front Door Face Lift as much as I do! I’m a firm believer that anything can be fixed with a nice coat of paint! 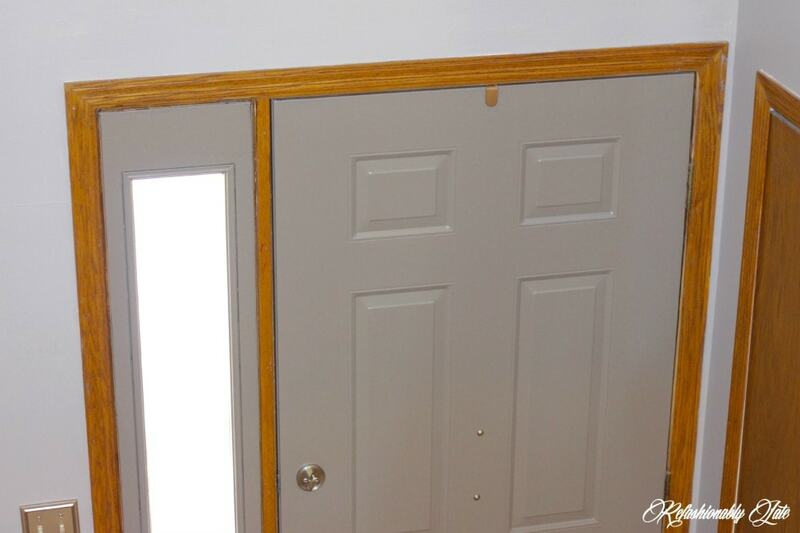 Throughout our house we have golden maple woodwork and trim. I have never been a huge fan of it but I’m living with it for a while before I decide to tackle the large project of painting it all! One thing I couldn’t live with was the the “fake” wood front door and door to the garage. 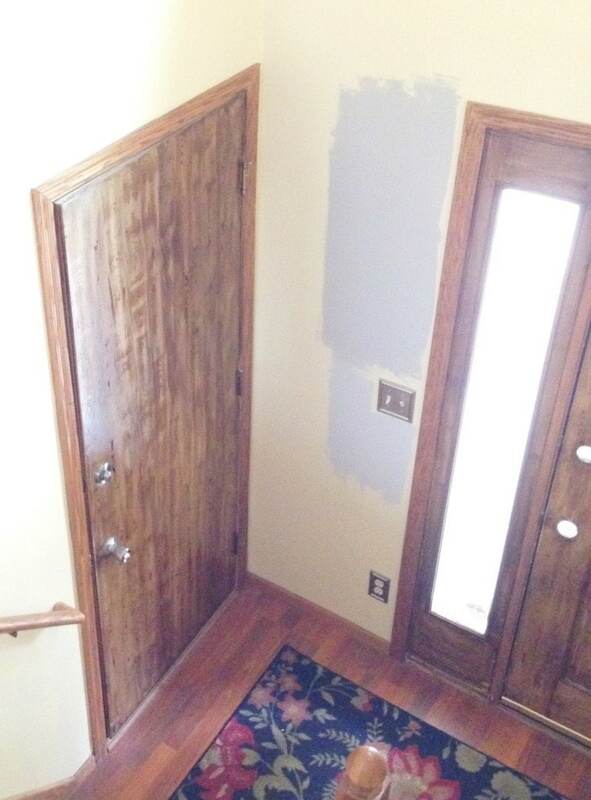 The previous owners decided to paint a wood like finish onto the doors to match the rest of the house. I guess it seemed like a good idea but it was very obvious it was paint and not actual wood. It was one of the first projects I wanted to complete because I just couldn’t stand the look of it. The outside of the front door was white and I wanted to spice up our curb appeal with a little color. 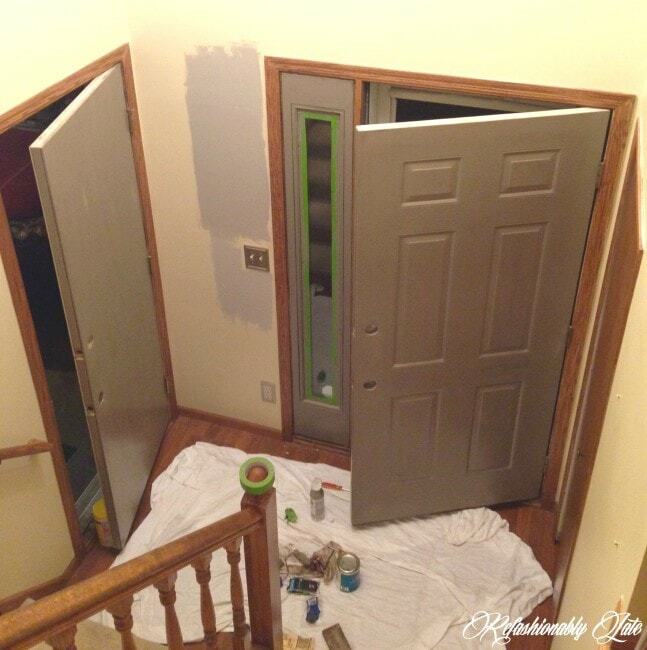 Since they had been painted before I didn’t feel the need to prime the doors. I’m a creature of habit and I loved the color I used on my tiles in my kitchen and thought it would really look great on the doors. You can see my previous post, one of my favorites, about my Tile Transformation here. Sherwin Williams has been our go to for paint because their paint has great coverage and it’s good, quality paint! It was a no brainer to me to choose the color called Backdrop. I started by using a foam roller but I didn’t like how it was applying to the door so I ended up brushing it on instead. 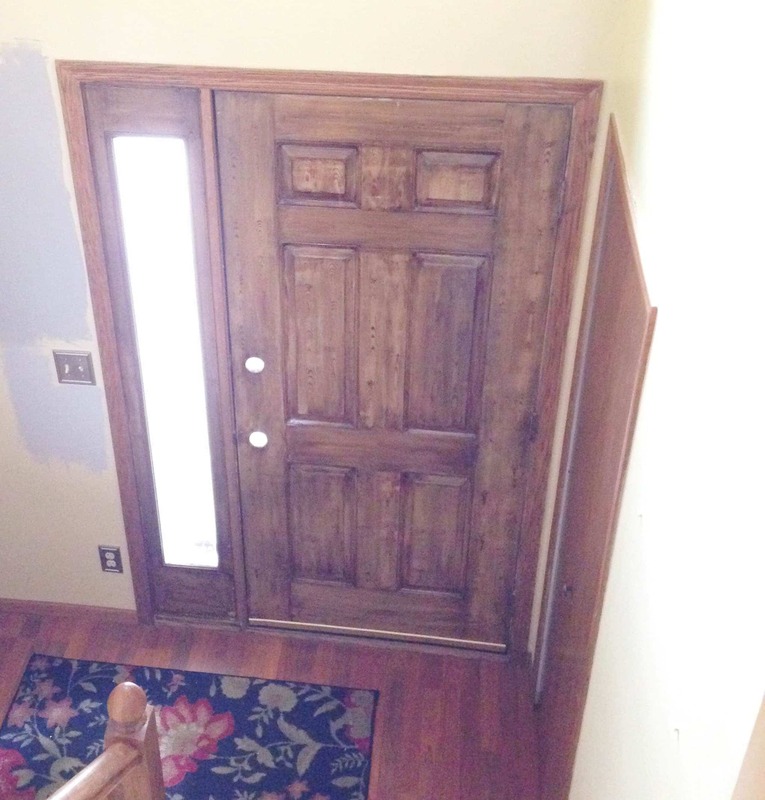 I applied one coat to both doors and waited until the next night to do a second coat. I wanted to give it a good 24 hours to dry so that it adhered properly. Since the front of the front door was white I had to do 3 coats of paint because it was so much lighter than the “fake wood.” This was the front door after one coat of paint. Here are both doors after a couple coats of paint from the inside…sorry lots of iPhone photos here! 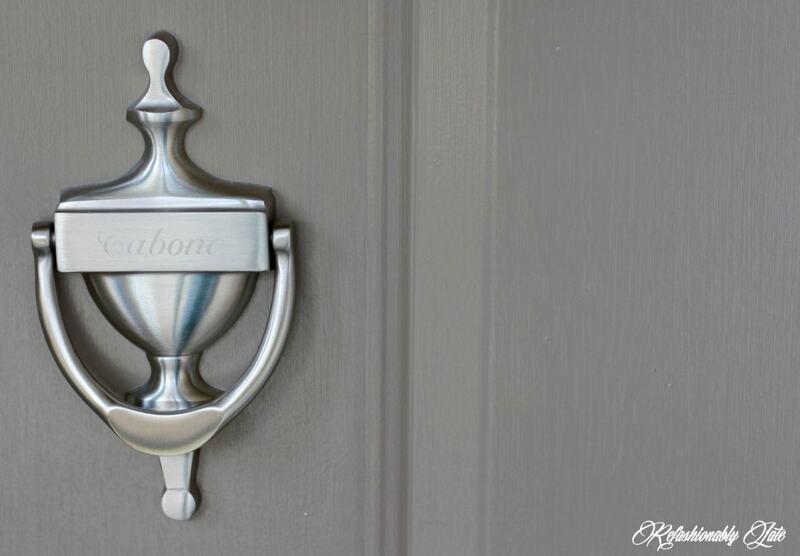 A small side project that I did was paint the storm door’s handles a brushed silver from the worn gold. It was rusting and looked very outdated. I taped around the fixtures with Frog Tape and spray painted it with Rustoleum Stain Nickel Metal Spray Paint. 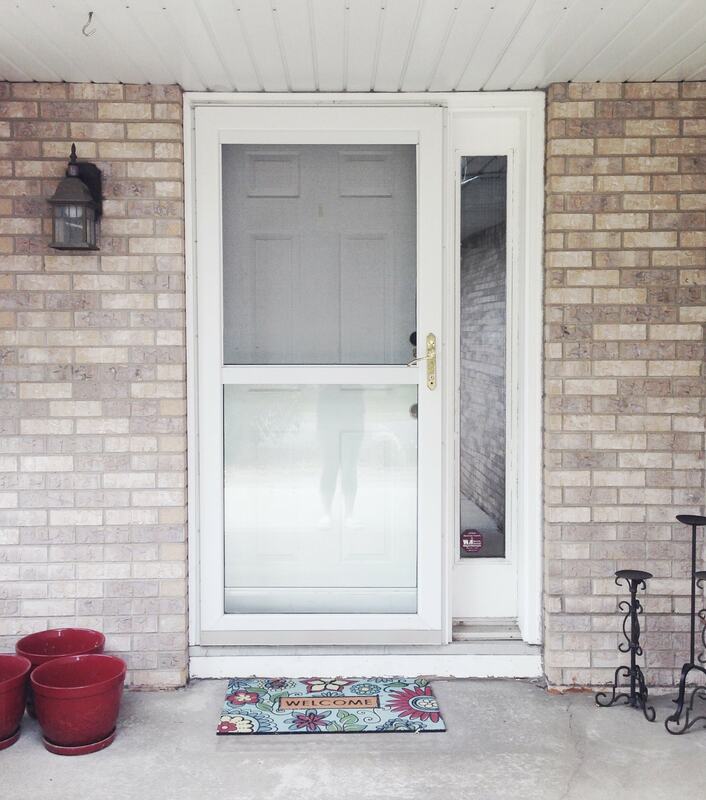 It was such a quick fix and really updates the storm door! 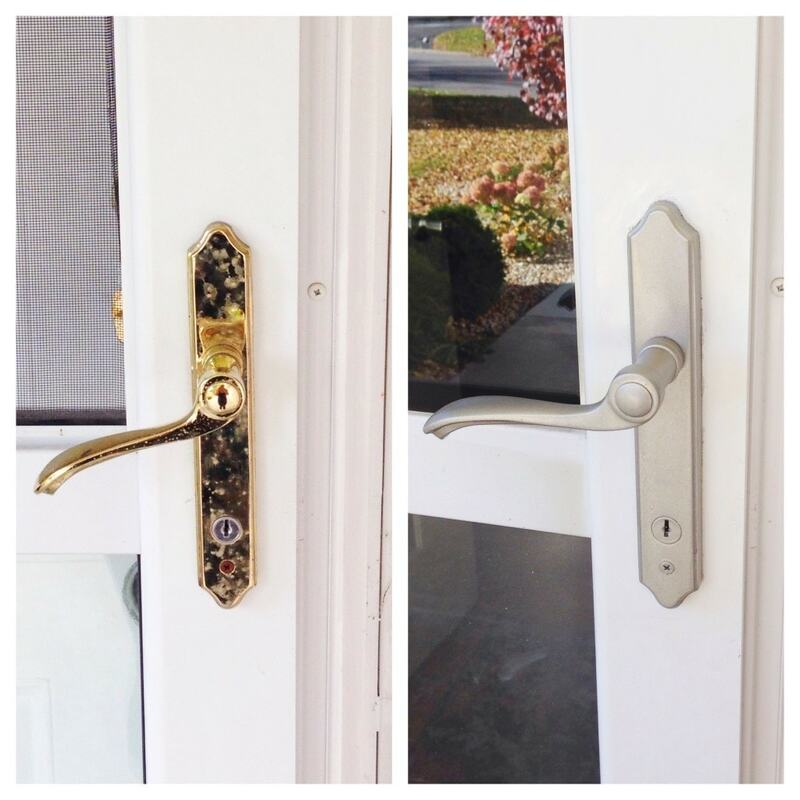 After the doors were painted and dry I was able to put all of the knobs and locks back on. (Make sure you keep all components together so that they are put back together correctly.) The darker gray really compliments the lighter gray on our walls. 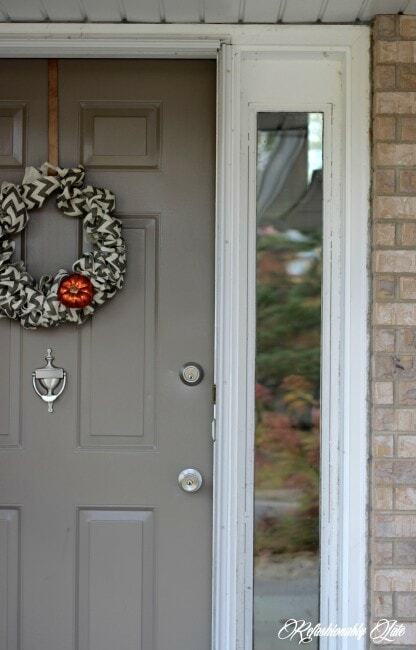 Outside the dark gray door also makes the gray undertones in our brick stick out. It really compliments our brick nicely. 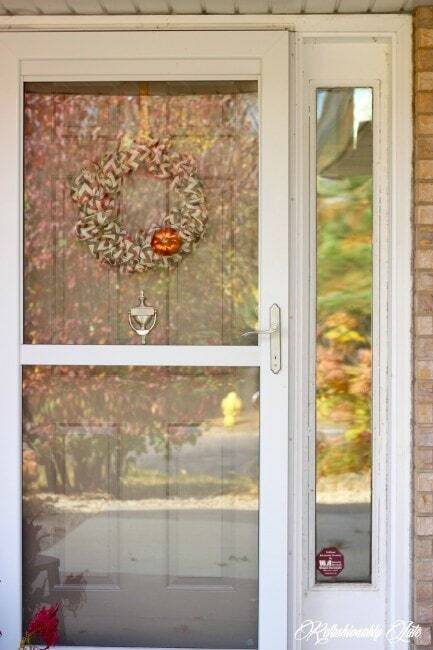 What a simple way to give your front door a facelift. It not only looks great but it ups your curb appeal. Aren’t the fall leaves in the reflection beautiful? 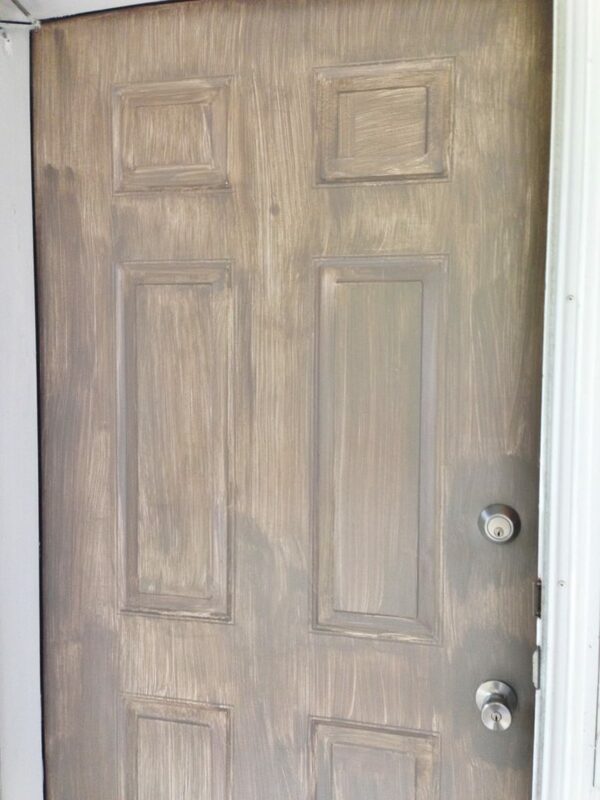 I love how the door turned out and definitely looks better than the “fake” wood. Thank you to Amanda for having me today and I’m looking forward to next month’s contributing post!